These tips are made of high density dark African wood. They are each turned on a lathe, hand cut, and then a drilled pattern is filled with metal and hard colored polymer inserts. The wood grain is so fine, the wood feels soft to the touch. They are truly works of art. They are all unique and range from 5 to 6 inches in length. The stainless receptacle on the end will fit into most 3 piece Egyptian hoses. These tips are extremely rare. Get them while they last! 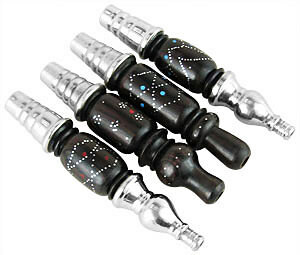 Premium Ebony Wood Tips has a average rating of 0 stars out of 5 stars based on 0 reviews.